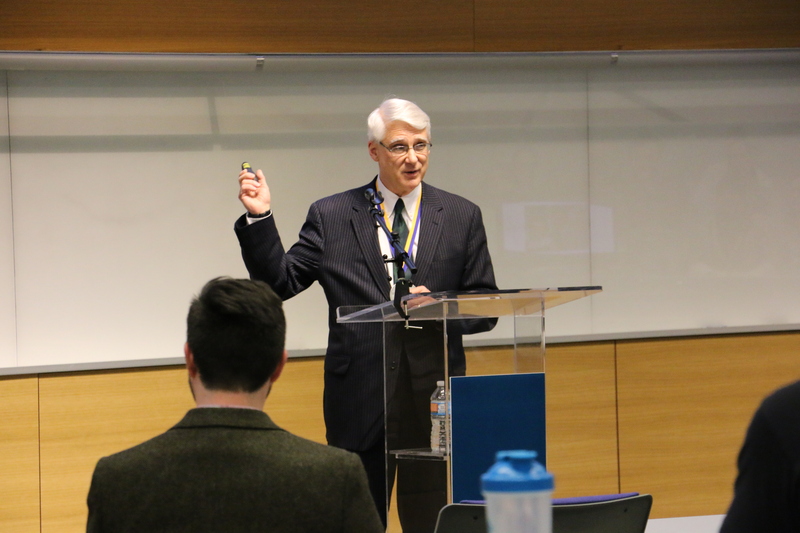 Entrepreneurship was the buzz word at the Henry W. Bloch School of Management this week. Two influential entrepreneurs spoke Wednesday, March 2, as part of the Regnier Institute for Entrepreneurship and Innovation’s First Wednesday series. Mike Wilson, CEO and co-founder of Niall, an American watch manufacturer, discussed the history and expansion of his business. Bob Regnier, Chairman, President and CEO of Bank of Blue Valley, is a lifelong champion of entrepreneurship – both in the traditional and social formats. Wilson, a 2006 Bloch MBA graduate, spoke to students, alumni and area business leaders about the start of his second business after his first venture was purchased by another company. He explained the journey of how Niall launched its first luxury timepiece, the Niall One, which took approximately three years to develop. At Wednesday’s event, Wilson unveiled the Niall GMT, which is now available for purchase. Wilson then gave a sneak preview of what was next for Niall, including a women’s line, leather goods, apparel and plans to open their first brick and mortar flagship store. Regnier, who along with his family is a member of the inaugural class of the Entrepreneur Hall of Fame, spoke of the transformative power of entrepreneurship. His entrepreneurial passion was greatly impacted by his parents, Victor and Helen, who fueled their own innovative spirits by developing subdivisions through Johnson County, eventually leading to a venture in commercial building, Vic Regnier Builders. Along with his siblings Victor and Catherine, Regnier established the Regnier Family Foundation in 1990 to honor their parents’ legacy. The foundation actively supports entrepreneurial engagement. In 2012 the Regnier Family Foundation endowed the Regnier Institute for Entrepreneurship and Innovation with a $3 million gift. Lamar Hunt, Jr. will speak Wednesday, April 6, as the third speaker in Bloch’s the Entrepreneur Hall of Fame Speaker Series sponsored by the Regnier Institute.